r/Ghosts – Thoughts?Found this video on Reddit, seemed pretty interesting. Found this video on Reddit, seemed pretty interesting. This video is supposed cctv footage of Ayda the haunted doll moving on her own. Ayda is supposedly so haunted that her owners wear a hazmat suit when holding her. Beenleigh Historical Village in Logan, Queensland, Australia, is an open-air museum with a haunted reputation. 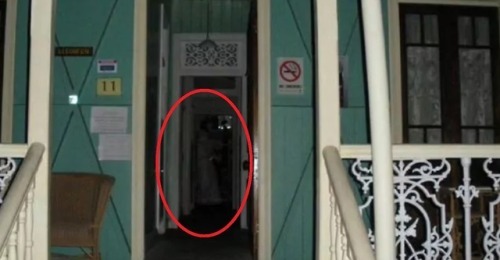 According to a local paranormal group, visitors and staff have heard a piano playing by itself and seen a woman in a white dress pacing the halls. Is that her in the photo above? Have a ghost photo you’d like to share? Send it to ghostsghoul@gmail.com. In 1989 a statue at the Holy Trinity Church in Ambridge Pennsylvania was the center of some unusual phenomena. 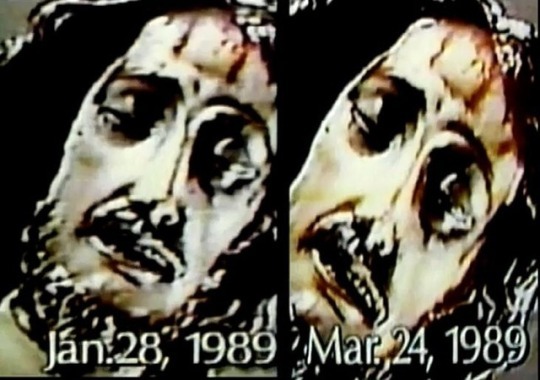 A server in the mass noticed that the eyes on a crucifix which were normally open were now closed with no explanation. The servers brother saw it as well. The two were crying over the supposed miracle and the priest who was also the boys uncle as well as another church worker began to cry after seeing its closed eyes. Many people came to Holy Trinity Church to see the crucifix for themselves. Some believe that the so-called miracle was a hoax or a scheme to get more people to worship at the church. There was little evidence to suggest a real miracle and the fact that the people who first noticed it were the priests nephews makes it suspicious. The show Unsolved Mystery’s looked into it and the episode aired in September of that same year, the mystery was unsolved.